According to our sources at the airport, the broken pipe resulted in water not being available in some parts of the airport complex. This meant that some workers and outgoing passengers have been inconvenienced as there is no water in the restrooms. “It’s not really a water shortage. 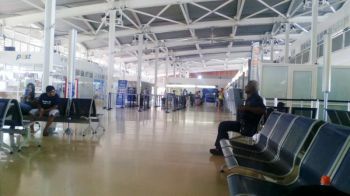 A pipe is burst so inside of the airport has water but the outer part doesn’t have,” said our trusted and reliable source. “They are now trying to fix it,” said the source. When contacted by our newsroom, Managing Director of the BVI Airports Authority Mr Denniston S. Fraser confirmed that the problem was caused by a broken pipe. “One of our main lines was broken but we are repairing it now,” said Fraser. “Because it’s a main line there is no water at the terminal,” he added. Asked when should the issue be fully rectified he said hopefully before the end of the day. Dem cant keep water on at the airport and dem crying over the dept of civil avation? Since when it takes two days to repair a lil broken pipe? There has been no water at Horsepath for the 5th week now and that didn't make the news. When calling the Water and Sewage Department for answers I continue to get hogged up and attitudes for inquiring about when consistent water flow will resume. The first week they said they had to fly a part out to replace the one that had been damaged and will work to get it up and running over the weekend. The next week I was told they were going to send water from town and long bush to Horsepath. The third week they said there was not enough pressure to send the water to Horsepath. The fourth week they said they can't give a date because the men are working on the problem. Five weeks and up to now there has been no public announcement or a post on their Facebook page to say what the problem is, or give the residents some sort of update with regards to the problem. Poor communication in my opinion. However, they have posted their disconnection schedule. Hilarious! No water supply, but still publishing when they are going to cut off water that is not even available. God bless this place and hopefully one day we will no longer be in a third world country where the basic necessities such as water supply will be provided without having to beg and plead with persons in power to give them to us freely. One day we shall get it together. One day! Newport Limousine serves RI and MA and specializes in multi-car weddings and guest transportation.newport limousine Service in Irvine, reviews by real people....contact us !